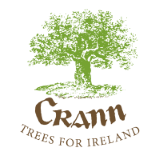 Crann Director, Dr. George Cunningham delivered a wide-ranging illustrative and personal talk. He tree-travelled from his midland home and around Ireland to the Pacific, the Caribbean and California. Drawing on his own extensive tree-book collection he highlighted some of his favourite volumes and writings as well as including trees in Irish history and historic tree places. The talk was appreciated by the audience and the interaction and feedback shared over a cup of tea was very engaging and encouraging.